I wanted to post this last week but track meets and church activities have been keeping us going, going, going. School is wrapping up and things are getting busy around here. I'm sure they are at your house too. Can you believe it's May already? A couple weekends ago hubby and I set out on a day trip. 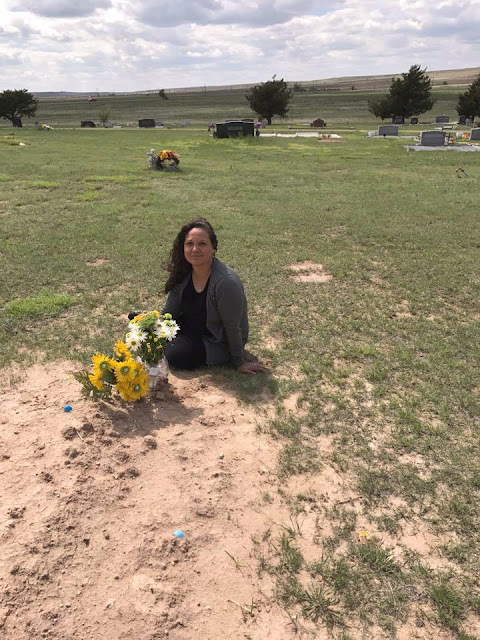 We drove four hours one way to visit my dad's grave. It was a long trip but it was way overdue. I hadn't been back to the cemetery since his birthday in November. I can't believe he's been gone seven months. We stopped at a supermarket on the way into town and picked up some fresh flowers. When we arrived at the cemetery I was surprised to see Easter eggs laying on his grave. Looked like some of his grand kids paid him a visit during Easter. They even left him some candy there for him. I thought that was cute. He would have loved that very much. To me it almost seems as if time has stood still since his death. I've isolated myself a lot from everybody and everything. I mostly stay home and keep to myself. More so than normal. Maybe it's just my way of healing. Maybe it's what I need at this time. I understand people grieve differently. Some people carry on and throw themselves back into the world like nothing. That's not me though. I need solitude. I need time away. I'll come back when I'm ready. That's what I keep telling myself. I still like to keep up with my blog. I see it as a journal where I can write down my thoughts. For the most part my online friends are encouraging and uplifting. I like to read and I like to write. It is a way to release some of the things we carry inside. The cemetery where my dad lays is ten miles out of town. As you can see in the photo it is incredibly peaceful and beautiful with the rolling hills and the big Texas sky. It's the perfect spot for a cemetery. It is quiet and serene. The only thing you hear is the occasional car passing through or the Texas wind that almost always seems to blow. 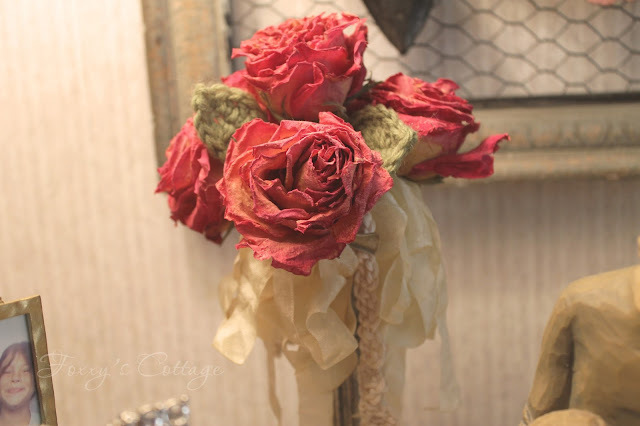 These dried roses are from my fathers funeral. I pulled a few roses from a floral spray we bought for him and brought them home with me. 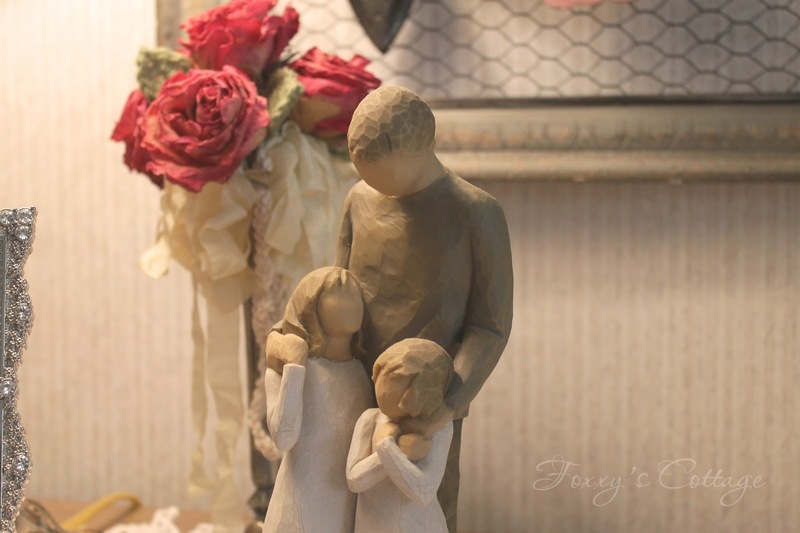 I keep them on my nightstand along with some pictures of him and this Willow Tree figurine of a father with his daughters. It's appropriately named My Girls. I have been absent from the blog world for a couple of weeks. I have been swamped with things to do. The website I told you about in my last post is up and running. I still work on it here and there finding ways to make it better. It will be one of those things that is never really finished but always in the works. I hope to make the rounds today and visit some of your blogs. I've missed it and I hope to catch up with all of you soon. Thank you always for reading and for your kind comments. They make my day and so do you. Your vignette of photos with the figurine and roses is so lovely. Gosh, it is hard to believe it's been 7 months. Time just keeps marching on even if we feel it's standing still. I am one who craves peace and quiet and so for that reason, I choose to mostly stay home. There are days when it is really hard for me to force myself out of the house. Nothing wrong with having time for quiet contemplation. And yarn. :) Yarn helps, too. Have a good week. Grieving is a process that is personal to each person so whatever is right for you is OK. You are in my prayers and hope that the pain of your loss will ease a little. Take care of yourself. Hi Beca, I grieved for my dad that way, too. I still talk to his picture. 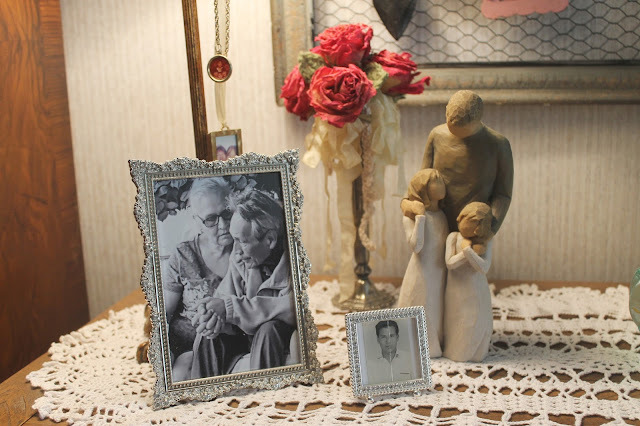 Grief is a gift from God. It washes over us in a way we can't control or dictate. I found that miraculous. Your dad was good and you are a good daughter. Hello Beca, I am so sorry about the passing of your dad and it takes a long time to heal.